5 weeks of cellular, transformational shifts, to unlock your full potential as a leader, a big player in your field, someone to watch, to hear and share and to create a mindset of long-term, sustainable success, and freedom of thought - for the rest of your life. What do you return to as your base, your normal, go-to response when things seem to be going backward, the wrong way, or not to plan? How do you respond to unforeseen events? Unfortunate turns of the wheel you weren't planning, or even minor changes to your schedule? When you're under pressure to perform, how do you show up? Do you stand up and shine, or are you steeped in self-doubt and forgetful of what you are here to do? Standing like a deer in headlights waiting for your brain power to return so you can use your feet to scurry you out of the spotlight. What about when you're "in it" and the pressure mounts or something unexpectedly changes and something you never planned for happens- and it stuffs up everything you'd been working towards? How do you respond to the world when things are growing, happening, changing steadfastly, and while you still have an aim in your life, you're forced to balance being in the moment, what is or what is being presented to you, with staying the course? When tragedy strikes, when something you were relying on falls through, when someone drops a metaphorical bomb, when you're not feeling the way you'd imagined you'd feel when it's time to get in and do the thing? How you respond is always up to you. It's funny, most people think practicing something enough when there's no pressure makes it all the easier when there IS pressure. It couldn't be further from the truth. I won 9 Karate world titles because I trained from a state of chaos. I was programmed to win. During this 5-week transformational deep-dive with me, I'm going to help you understand what winning is really about and how to attain a lifetime of winning. On the surface, and what looks great to most of the world, are the trophies, the accolades, the big numbers, the beautiful photographs, the followings, the awards, the income, the recognition. Yes - I'll show you how to reach those, as I have done so with many before you. But winning, the key to winning is something cellular. The key to the above is something that goes beyond caring about those things at all and dives much deeper into the psyche of the person who is willing to stand at the forefront and take the risk of failure. To risk winning. To risk becoming the person who is now faced with the world of being a winner. To have 15 minutes of fame is not what I am teaching here. This is about becoming someone to be listened to, watched, heard, repeated, shared, and someone who leads from the front in a way that will change the world, visibly, over time, for the rest of your life, in everything you do. Someone who creates their own definition of success, love, mastery, and high performance, and shapes their world from the inside out. Someone who is so calm in their winning skin they become magnetic to the world around them. Programmed to win, is about freedom. As a martial artist, we had a practice we called "Train from Behind." It means to train like you're under pressure and to simulate experiences you may be faced with in reality. We'd set up a ring, and a 30-second timer, and we would train as though we were three points down, and we had 30 seconds on the clock, and it was the Finale of the World Titles. We had 30-seconds to reclaim the last two years of training, the pressure that had surmounted from the points being collected on your head, and to win back the title we had traveled across the world to retake. People would scream, and someone would be the opponent in front you, desperate to keep their points for the last 30-seconds so they'd win. I never thought it'd really happen, because I spent almost 30 hours a week training to win and practicing my drills, so I didn't have to think about them. And then it did happen. I was literally 2 points down in a fight to get to the finals, faced with needing to make up the difference with 30 seconds on the clock. 30 seconds and it was all over for me. I had traveled from Australia to England. My opponent relaxed. She knew all she had to do was block my attacks - because if I couldn't get the points, she won. But I had trained from this place. I knew what to do, and it completely took her by surprise. To the audience watching, it was the greatest comeback. To the athlete, it was a training drill that played out perfectly. Rehearsal is key. All kinds of weird stuff changes in your body when you're under pressure. When you're 'in the ring'. When adrenaline is pumping through your veins or time is limited, or people are watching. The things that felt so easy in the safe isolation of your own safe space suddenly requires all of your energy to do while feeling at half the capacity. I spent many years attending different intense speaker and leadership training where we'd simulate real-life scenarios in the Australian bush, and have to act without knowing what was going to happen next. From war scenes to the Olympics, to building empires in kingdoms in the 1700s and being faced with death, disease, debts and all kinds of other challenges. There were props, costumes, music, noises, lights, people playing characters, and we were often sleep-deprived, too. It was very real. Afterwards, we'd debrief how we showed up so we could learn from the experience, and take to the 'real game' of life, what we'd learned. One time, I "died" very suddenly in one of these games. It was life-changing to realise how quickly things can be over. That's a story for another time though. Every time I sing on stage, I sound nothing like I sound in the shower. (you too!?). My voice croaks, I can't hit the same notes easily, and my arms feel heavy as lead. Every time I sing in front of other people (Like I do at every speaking gig I do), it gets a little easier, a little less awkward, but it's never the same than in the safety of my own space. Becoming programmed to win requires consciously putting yourself in the way of contagious mindsets, and situations where you will grow, exponentially. The 5 Keys to Creating Anything you Want. Here's to Winning, to an abundance of love, riches, astounding friendships, connections and opportunity, happiness, and vibrant health. In this 5-week transformational deep-dive with me, you're going to experience what a quantum leap in your thinking looks, and feels like. The kind that has you look back on your life a few months ago, and not recognise the Person in the mirror. Her fears and doubts about what she was capable of - that you will have just proven to yourself was so close in front of you, you didn't even realise it. You will complete this solid performance training with both practical tools and mindset support, so not only will you be DOING The practical work, but, you'll have it to return to at any time in your life when you're ready to use it once again, for the purpose of winning - Whatever that means to you. You can keep this course forever. 1 - Having a clear purpose and clarity of mind. Understanding how to think and what to think, so you're on the front foot and leading your own mind, not being distracted by what's around you, but creating your world from the inside out. 2 - Taking aligned action with that purpose. Acting with Confidence. Being utterly willing to fail, and to know what to do with that failure so it reaps a reward of equal value. 3 - Being willing to do whatever it takes to stand the test of time. Understanding and grounding into a new concept of time time is the piece that has the first two steps naturally work with the laws of the universe. It is what has these first two keys crystallise to become your everyday being. This is the tipping point to solidifying the sustainability of this work. 4 - Dealing with inevitable adversity with an open mind, a clear heart, and an understanding of not only how to “get through it” but how to do the deeper self-actualising that has you better off for experiencing a setback. I promise, you will become excited when you hit roadblocks when you look at things in this way! 5 - The nature of being in a consistent state of high level peak performance, ease, wealth-consciousness, and flow. This final piece is where we take the intangible, and bring it to life. You get to enjoy the freedom and exponential success of being consistently tapped-into the quantum. An extreme state of trust, awareness, on-point intuition and deep presence, which fuels the existence of a winner in every cell of her being, through all of her pursuits. Programmed to win will change the way you 'show up' both in your life, moment to moment, day to day, breath by breath, and, the way you 'show up' when life takes unexpected turns. 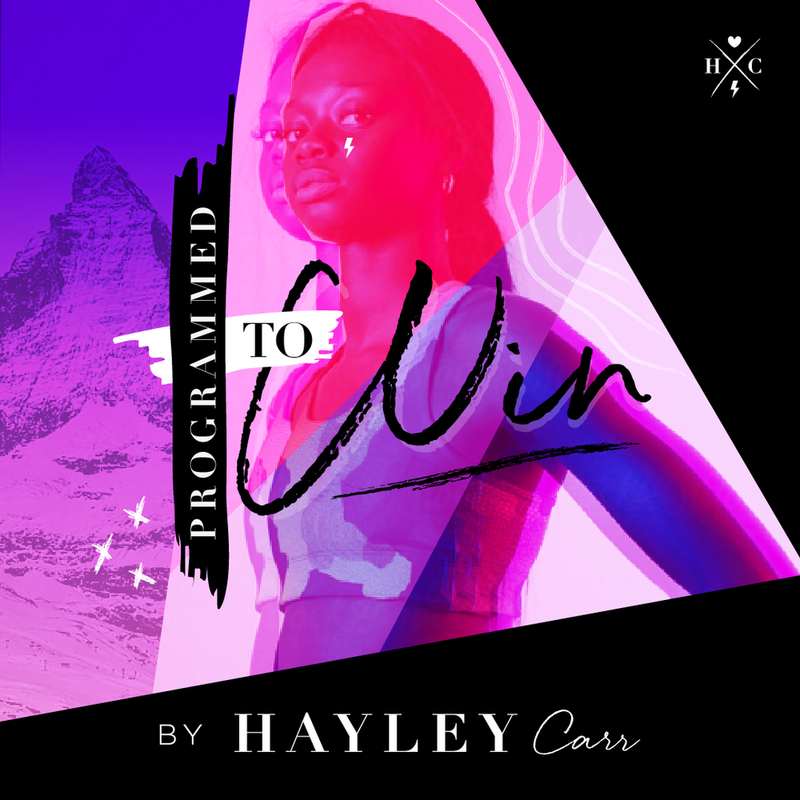 Programmed to win will teach you how to think your way through difficulty, to create the experiences you desire using the creative power of your own brain, to lead from a place of certainty and faith, and to morph yourself into the kind of leader you are here to be. To make the difference, you're here to make. To stand the test of time. To make sustainable choices, (even if they are hard ones), and to move with confidence in any direction of your choosing, regardless of what the world thinks of your choices. If you are in business, programmed to win will teach you what you need to know to become someone who is so free that people can't help but watch and listen. If you're a performer or athlete, Programmed to Win will help you create wins over time by upleveling the way you look at your training, your opportunities, and your failures. You will be able to walk into any performance and feel entirely at ease with whatever happens on the stage. You will know what to do with it. If you're a curious seeker, and you'd like to improve the way you show up at work, in your personal relationships, and to taking care of the body your mind is housed within, (aka: your health), Programmed to Win will instruct you precisely on how to think so you're never afraid to say what you really mean, ask for what you want, negotiate, say no, set boundaries and assert them with your energy, and manifest ANYTHING you desire in this physical world. This is a course in FREEDOM. The freedom to fulfil your potential. Journalling prompts to excavate the inner-work for quantum shifts. Bonus content for dealing with adversities in life and business from a programmed to WIN mindset. and a lifetime of free-thinking. Imagine where you could be in 90 days if you dropped all fear and doubt, and became instead, programmed to win. Pay in full, on a payment plan, or, Choose the VIP option to get a deep dive 1:1 session with me plus more. We begin March 1st, Pre-work begins 21st Feb.
ProgrammeD to Win, + 1 x 1:1 deep-dive session with me, + BONUS group coaching call for VIP's ONLY.